Department of Specialized and General Surgery, Fluminense Federal University, Rio de Janeiro, Brazil. Citation: Reis PEO, Cruz KID, Coselli JS (2018) Challenges for Treating the Aortic Arch. 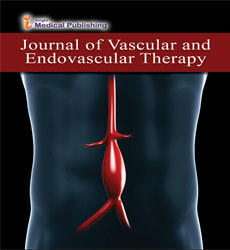 J Vasc Endovasc Therapy. 3:10. To date, all surgical approaches to aortic arch remain a challenge; as befits this highly complex aortic repair, several techniques have evolved to treat the transverse aortic arch . Historically, the aortic arch has been treated with open surgery . Open resection and replacement of the transverse aortic arch carries with it considerably high morbidity and mortality, with a mortality of 0-15% and stroke rate 0-11% . In contemporary practice, because less invasive endovascular approaches to abdominal aortic aneurysm repair demonstrated lower rates of morbidity and mortality than open surgery,  there is great interest in applying endovascular approaches to the aortic arch in hopes they may reduce the associated risks of repair. Recent developments in aortic arch repair include approaches that are tailored patient-specific pathology. For aortic arch aneurysms associated with descending aortic aneurysms, a twostaged elephant trunk technique has commonly been employed, using a traditional open stage to replace the transverse aortic arch and followed by an open or an endovascular second stage to complete the repair (Figure 1A-C). Building on this experience, frozen elephant trunk approaches facilitate extensive aortic repair is a single stage by combining open and endovascular techniques (Figure 2A and B). Another variation on this approach is useful in acute DeBakey type I aortic dissection: here, an open procedure is used to perform a hemiarch repair, which is followed by the antegrade deployment of an endograft (Figure 3A and B). Hybrid arch repairs combine open and endovascular approaches to repair. Typically, the brachiocephalic vessels of the aortic arch are rerouted by debranching, which then allows a stent-graft to be endovascularly placed across the entire transverse aortic arch, covering the anatomical origins of the brachiocephalic vessels, and additionally permits the treatment of the descending thoracic aorta (Figure 4A and B). Although hybrid arch repairs may be performed without aortic graft replacement, commonly a portion of the ascending aorta or aortic arch is replaced via a median sternotomy. Hybrid arch repair can be carried out without the use of cardiopulmonary bypass. Figure 1: An illustration of a proximal aortic aneurysm (A) extending into the descending thoracic aorta. In a classic stage-1 elephant trunk repair (B), the transverse arch is replaced using an open Y-graft approach; a small-section of graft, the elephant trunk, extends into the descending thoracic aorta to be used in the completion stage. An endograft (C), is proximally landed inside the elephant trunk to complete the repair as a “hybrid elephant trunk.” Used with permission of Baylor College of Medicine. 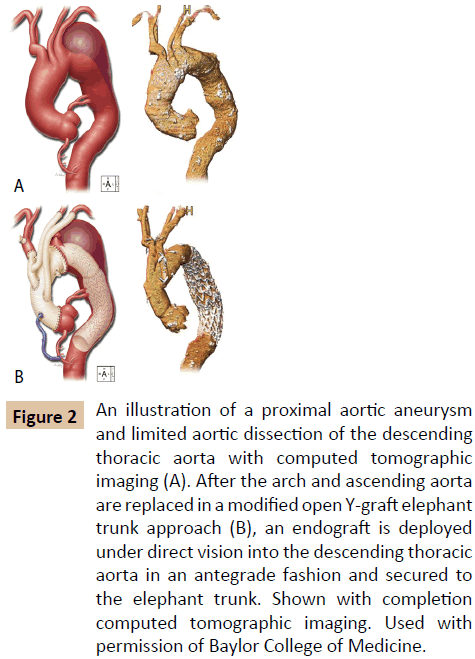 Figure 2: An illustration of a proximal aortic aneurysm and limited aortic dissection of the descending thoracic aorta with computed tomographic imaging (A). After the arch and ascending aorta are replaced in a modified open Y-graft elephant trunk approach (B), an endograft is deployed under direct vision into the descending thoracic aorta in an antegrade fashion and secured to the elephant trunk. Shown with completion computed tomographic imaging. Used with permission of Baylor College of Medicine. 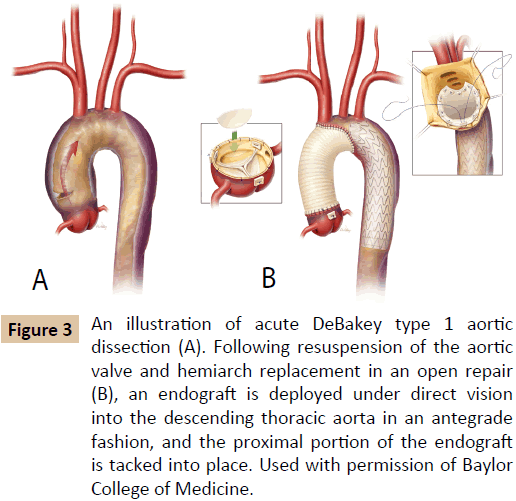 Figure 3: An illustration of acute DeBakey type 1 aortic dissection (A). Following resuspension of the aortic valve and hemiarch replacement in an open repair (B), an endograft is deployed under direct vision into the descending thoracic aorta in an antegrade fashion, and the proximal portion of the endograft is tacked into place. Used with permission of Baylor College of Medicine. 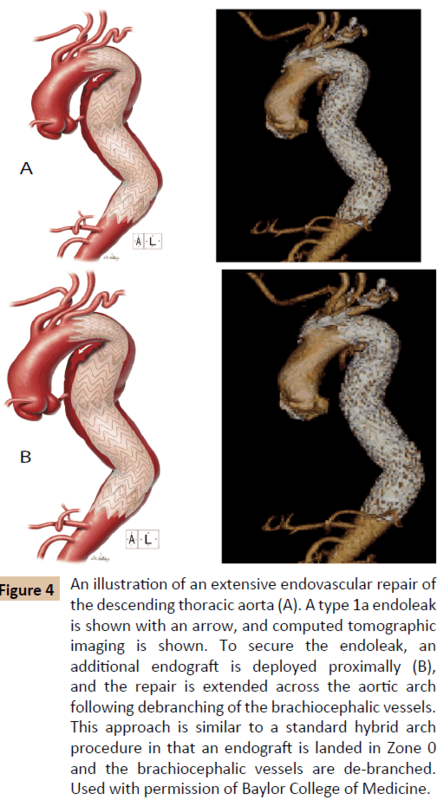 Figure 4: An illustration of an extensive endovascular repair of the descending thoracic aorta (A). A type 1a endoleak is shown with an arrow, and computed tomographic imaging is shown. To secure the endoleak, an additional endograft is deployed proximally (B), and the repair is extended across the aortic arch following debranching of the brachiocephalic vessels. This approach is similar to a standard hybrid arch procedure in that an endograft is landed in Zone 0 and the brachiocephalic vessels are de-branched. Used with permission of Baylor College of Medicine. The development of endovascular technology has facilitated total endovascular repair of complex aortic aneurysms, by using fenestrated and branched endografts or by using the sandwich technique [2,4]. In 2012, Lobato published a study regarding safety and efficacy of 78 patients undergoing complex thoracic or abdominal endovascular aneurysm repairs that were repaired by using the sandwich technique; his results concluded that this approach (including select vessel revascularization in adverse anatomical scenarios) safely excludes the aneurysm with sustained durability in midterm follow-up . Increasing amounts of data support the use of visceral and arch chimney graft techniques [6,7]. However, fenestrated and branched stent grafts have not yet become widely used because the endografts are typically customized and take several weeks to manufacture, they remain costly, are difficult to use in patients with tortuous aneurysms, and may be difficult to deploy in patients with compromised access [6,8]. Although the sandwich technique was developed to permit an endovascular approach to thoracoabdominal aortic aneurysms, these aneurysms (with and without secondary aortic dissection) remain a challenge to repair safely, efficiently, and inexpensively . Emerging endovascular technology permits total endovascular correction of complex aortic arch aneurysms by using fenestrated and branched endoprosthesis. In addition to the challenges of engineering a durable device that may be deployed safely, additional aspects regarding repair should be taken under consideration. These include the aortic pathology, patientspecific anatomic details, such as the precise distance of the proposed endovascular landing zone to the aortic valve or the coronary arteries , as well as the durability of the device materials. Although future repair of the aortic arch will likely focus on completely endovascular approaches, hybrid and sandwich techniques may be considered as interim solutions. Shrestha M, Martens A, Kruger H, Maeding I, Ius F, et al. (2014) Total aortic arch replacement with the elephant trunk technique: single-centre 30-year results. Eur J Cardi Thorac Sur 45: 289-296. Maurel B, Sobocinski J, Spear R, Azzaoui R, Koussa M, et al. (2015) Current and future perspectives in the repair of aneurysms involving the aortic arch. J Cardiovasc Surg 56: 197-215. Chaikof EL, Dalman RL, Eskandari MK, Jackson BM, Lee A, et al. (2018) The Society for Vascular Surgery practice guidelines on the care of patients with an abdominal aortic aneurysm. J Vas Sur 67: 2-77.e2. Karck M, Chavan A, Hagl C, Friedrich H, Galanski M, et al. (2003) The frozen elephant trunk technique: a new treatment for thoracic aortic aneurysms. J Thorac Cardiovasc Surg 125: 1550-1553. Lobato A, Lobato L (2012) Endovascular Treatment of Complex Aortic Aneurysms Using the Sandwich Technique. J Endovasc Ther 19: 691-706. B Lindblad, A Bin Jabr, J Holst, M Malina (2015) Chimney Grafts in Aortic Stent Grafting: Hazardous or Useful Technique? Systematic Review of Current Data. Eur J Vasc Endovasc Surg 50: 722-731. Kolvenbach RR, Yoshida R, Pinter L, Zhu Y, Lin F (2011) Urgent endovascular treatment of thoraco-abdominal aneurysms using a sandwich technique and chimney grafts a technical description. Eur J Vasc Endovasc Surg 41: 54-60. Dias NV, Resch TA, Sonesson B, Ivancev K, Malina M (2008) EVAR of aortoiliac aneurysms with branched stent grafts. Eur J Vasc Endovasc Surg 35: 677-684. Lobato A, Lobato L (2012) A new technique to enhance endovascular thoracoabdominal aortic aneurysm therapy-the sandwich procedure. Semin Vasc Surg 25: 153-160.